One of my girls trips was to the beautiful island of Jamaica. We decided to plan a trip around the Keith SweatFest in Montego Bay (Mobay) that we saw advertised on Instagram. The Keith SweatFest was to be an outdoor concert that featured a bunch of old school R&B singers and groups, and I just couldn’t pass up on seeing my boyz Silk perform along with some of my hometown faves and DMV’s finest like Raheem DeVaughn, Ginuwine, Tank and Dru Hill. A few of us stayed at an all-inclusive resort, while the others booked a room at a guest house in the Unity Hall area of Mobay that was directly on the water. The owner of the home became our personal driver and tour guide and chaffeured us wherever we wanted to go. His home was absolutely gorgeous! Marble floors throughout with immaculate views of the ocean. I found myself waking up early each morning just to go sit on my favorite bench, eat breakfast and watch the fisherman on their boats make their morning catches. It honestly was the most serene experiences I’ve ever had. If you ever plan on visiting Jamaica, and you’re not one that requires the hustle and bustle of a resort, Water’s Edge Guest House is definitely the place to stay. I had the most delicious curry chicken while there. Lawd hammercy it was yummy! We ended up in Negril on one of our road trips, where we experienced the amazing Seven Mile Beach. We indulged in a few strawberry daquiris then took a glass bottom boat tour, parasailed, snorkeled (well…I found myself to be the only one to snorkel LOL), and a raft tour. Sadly the photos from parasailing didn’t come out well, but we had an amazing time nonetheless; but at least I got to cross that one off my Life List. We got to experience the famous Rick’s Cafe where folks were diving a gazillion feet off that cliff and into the water. Insane is what it was. The most baffling part of this particular road trip was on our way back. Every few miles we’d see a random crab scurrying across the road and there’d be a few guys with buckets chasing behind them attempting to catch them to sell (as we were told); and it was pitch black outside. We’d just see eyeballs in our headlights as we approached them and had some crazy near misses. We saw and even heard some of them being crushed by other vehicles going the opposite direction. It was the creepiest thing. Ocho Rios was one for the record books. During our early morning drive from Mobay to Ocho Rios, we got quite the history lesson on Jamaica, and what our own history books didn’t tell us about Christopher Columbus (it made me wonder how much other bogus information we were lead to believe in our history books in grade school). The current state of politics and law enforcement was very disheartening. It was humbling to learn about how the small island overcame such hardships, but it was more encouraging and uplifting to see how strong and full of faithful pride the people were/are. Although it is a beautiful island, it is also very poverty-stricken in most areas. It was definitely an eye opener. It reminded me to always be grateful and be appreciative for life itself. Dunns River Falls was amazeballs!!! (I did it again! LOL) We met some amazing folks from all walks of life. Families from London, China, Australia, you name it. This experience allowed everyone (complete strangers) to trust each other while climbing up the falls–as it would be almost impossible to do alone. Definitely a must if anyone visits Ocho Rios. The Glistening Waters Luminous Lagoon in Falmouth was probably the most amazing thing I’ve ever experienced. Call me a cornball, but it was. The lagoon is where the Martha-Brae River which is fresh water, meets with the salt water of the ocean and the water illuminates (or glistens as it’s called) at the touch of it. It was purely magical. Again, I found myself to be the only one from my crew to jump in the water to experience it, but hey, I’m never one to miss out on an amazing experience. Truly amazing. All in all, I had the most grand-tastic time in Jamaica; I definitely plan on visiting again, as there was so much I didn’t get to see and do. 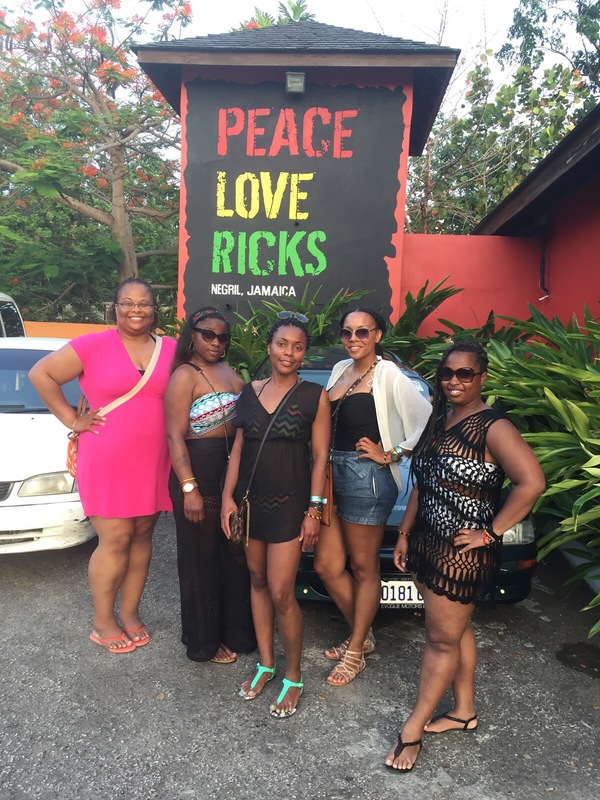 Check out the video below from our Girls Trip to Jamaica. It was. I had a ball!